As with any meaningful medical consultation, the electrodiagnostic medicine consultation must begin with obtaining a pertinent history and performing a physical examination. The history is not discussed in this article, but it obviously forms the basis of the ensuing examination by providing an understanding of the referring question, the patient's symptoms, and relevant past medical, surgical, and social history. Without an appropriate history and physical examination to guide the sequence and choice of specific electrodiagnostic tests, electromyography (EMG) and nerve conduction studies (NCSs) become an exercise in miscellaneous data collection, which can be misleading, useless, or even potentially dangerous. [7, 8] This article starts with a brief description of general and musculoskeletal examination components but focuses primarily on the neurologic examination. For most electrodiagnostic consultations, the examination focuses on the neurologic system; however, in many cases, the patient may be aware only of symptoms without any existing or known diagnoses. If the history is at all suggestive of a generalized process (eg, myopathy, polyneuropathy, neuromuscular junction disorder), then a general examination may be useful in defining a particular systemic medical illness. Initial assessment of vital signs can alert the clinician to cardiopulmonary or infectious problems and to possible contraindications to testing. Avoid tests at sites of any open wounds or infected areas, as well as needle examination where risk of compartment syndrome is high (at sites of bleeding or infection). Palpation can clarify areas of warmth, swelling, edema, tenderness, lymphadenopathy, or organomegaly. 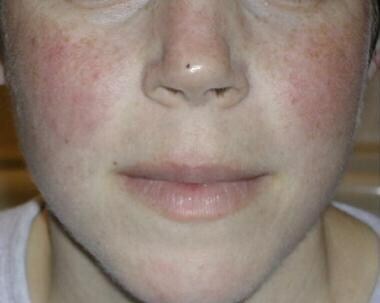 Look for various manifestations of systemic diseases, such as the butterfly rash (see the image below) associated with polymyositis or the petechial rash seen in vasculitides. Other findings, such as loss of distal hair, trophic skin changes, nail changes or nevi, tumors, or other visible lesions, can lead to various diagnostic impressions that may help in designing an electrodiagnostic evaluation that will make it possible to obtain the most useful information needed to arrive at the appropriate diagnosis. Another important aspect of the general examination is a specific search for any physical impediments to the acquisition of useful electrodiagnostic information. For example, peripheral edema, calloused or scarred skin, dirty areas, or areas that have been covered with lotion can decrease the ability to obtain accurate information, particularly from the sensory NCS. Expertise in the musculoskeletal examination is tremendously helpful in electrodiagnostic consultations, especially when pain and dysfunction are presenting problems. Pain obviously has many different generators and is often not associated directly with the nervous system. For example, having the ability to define myofascial pain with referral patterns can help to avoid an extensive search for radiculopathy that does not exist. This skill is important in assessing complaints of weakness as well. Pain can often inhibit function, mimicking neurologic weakness and misleading the electromyographer into looking for axonal or conduction block conditions. Also, tenosynovitis in the wrist and fingers is a common presentation and is often mistaken for carpal tunnel syndrome (CTS). Another issue that needs to be assessed is any potential barriers to normal neurologic function. For example, the finding of focal muscle atrophy does not imply definitive axonal injury or entrapment. Joint contracture may be present for neurologic or rheumatologic reasons or other means of contracture, such as postburn scarring. This immobility may eventually lead to disuse atrophy. During the musculoskeletal examination, an attempt should be made to define range of motion (ROM), areas of tenderness, or trigger points. The pain or dysfunctions should be isolated to joint, ligament, tendon, bone, muscle, or skin. The differences in active ROM versus passive ROM and the understanding of kinesiologic function for stabilizing and reciprocal muscles can lead to accurate diagnosis of involved structures that may or may not correlate with neurologic problems. For example, the assessment of scapulohumeral rhythm may suggest weakness in the scapular rotators rather than in the deltoid, or it may point out mechanical problems, such as scapular rib adhesions or adhesive capsulitis and frozen shoulder syndromes. Palpation of joints, bone, ligaments, tendons, and muscle to delineate sources of pain, tenderness, or trigger points. This practice can help to define referred pains and can be used to begin the process of differentiating neurogenic versus musculoskeletal origins for these pain symptoms. Aside from defining motor and/or sensory involvement, the examination should assess various patterns, such as distal versus proximal, symmetry versus asymmetry, or isolated versus generalized findings, which can help to solidify a diagnostic impression and direct an appropriate selection of electrodiagnostic testing. The techniques involved in manual muscle testing also are quite important. To test the biceps specifically rather than the brachialis or brachioradialis, the clinician would test supination, not elbow flexion. Controlling for other muscles is often helpful. The finding of isolated abductor pollicis brevis (APB) weakness can be supportive of a median neuropathy at the wrist (CTS). [11, 12] Testing of the APB, however, can be tricky. If the thumb is not positioned properly to control for the combined vector forces of the extensor pollicis longus and flexor pollicis longus, weakness in the APB can be missed. See the image below. Patterns of weakness or tenderness also can suggest primary muscle disease, such as that seen in various myopathies. Assess also various reflexes, including the monosynaptic muscle stretch reflexes, such as the patellar or Achilles reflex, and the polysynaptic superficial reflexes, such as the plantar, cremasteric, or abdominal reflex. See the lists of typical reflexes (below). An underlying knowledge of neuromuscular anatomy is essential to examine a patient usefully, which is nowhere more apparent than in patients with brachial or lumbosacral plexopathies. [3, 13] Knowing which muscles are supplied by which roots (myotomes), cords, trunks, divisions, and peripheral nerves, as well as the sensory pattern of root dermatomes contrasted against the peripheral nerve patterns, is a must. Many laboratories have a chart available. When symptoms dictate, evaluate for scapular winging, because the pattern of winging is correlated with specific nerve/muscle lesions and can guide the choice of nerves and muscles to evaluate in the ensuing EMG examination. Serratus anterior (ie, long thoracic nerve) winging - The medial border of the scapula protrudes posteriorly and medially, with the inferior angle of the scapula rotating medially as well. Resisted protraction or forward flexion accentuates the winging. Abduction decreases the winging in this case. Rhomboid (ie, dorsal scapular nerve, C5 root) winging - The scapula displaces laterally, with the inferior angle of the scapula rotating laterally, particularly with arm elevation over the head. Trapezius (ie, spinal accessory nerve, C3-C4 roots) winging - The scapula translocates laterally, but the inferior angle rotates medially. Abduction accentuates this winging, and forward flexion decreases it. The shoulder also drops on the involved side, compared with the contralateral side. Although the term "deep tendon reflex" has been used historically to describe the deep reflexes, this name actually is a misnomer, because the deep reflexes are muscle stretch reflexes (not to be confused with true tendon reflexes, ie, Golgi tendon reflex). The superficial reflexes are elicited by sensory afferents from skin, rather than muscle. Deep reflexes are muscle stretch reflexes mediated by lower motor neuron (LMN) pathways, typically monosynaptic. These reflexes decrease with an LMN lesion and increase with an upper motor neuron (UMN) lesion. Superficial reflexes are mediated by UMN pathways, typically polysynaptic. Either an LMN lesion or a UMN lesion causes loss of these reflexes in general; however, because of the polysynaptic connections in some superficial reflexes, a UMN lesion changes the response instead of extinguishing it (ie, the plantar responses). The Golgi tendon reflex represents neither of the above reflexes. The Golgi tendon organ is a stretch receptor at the musculotendinous junction. These receptors are one tenth to one thirtieth as sensitive as the muscle spindle; when stretched sufficiently, they induce inhibition of that muscle's alpha motor neuron and its associated gamma motor neuron to the spindle (opposite response of spindle). The following reflexes are listed according to muscle, root, trunk, cord, and nerve. All of the following methods elicit identical graded responses, depending on the degree and age of the UMN lesion. Hoffman sign is elicited by a brief flexion flick that causes a quick extension of the distal interphalangeal joint of the middle finger, resulting in a flexion response of the thumb; in more pronounced reflexes, all of the fingers flex. 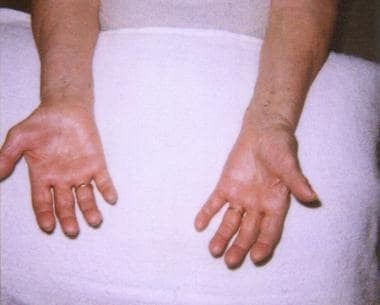 The Hoffman sign generally is considered a sign of hyperreflexia, although it can be seen in normal patients. Hoffman sign usually is absent in unaffected patients and is present in patients with pyramidal tract lesions (similar significance to plantar response, but it is not a deep or superficial reflex). Frontal release signs suggest lesion in the frontal lobes (eg, glabellar, suckling and rooting, grasp). Fasciculations seen clinically, as opposed to those seen during EMG, are abnormal movements of groups of single muscle fibers (ie, fascicles, muscle bundles); the movements are powerful enough to be visible within a muscle but usually are not great enough to move a joint. These fasciculations may be seen in individuals without abnormalities, but, when associated with atrophy, they typically indicate abnormalities in the LMN pathway. Tremors can be seen in various disorders of the brain, such as the fine, pill-rolling, resting tremor in Parkinson disease. Intention tremors can be seen in cerebellar diseases and postural tremors can indicate various conditions, such as anxiety or metabolic disturbances. For example, a fine, rapid tremor can be seen in hyperthyroidism, while the flapping tremor of Asterixis can occur in liver, renal, or pulmonary failure. Choreiform or athetoid movements are seen in brain disorders. Assess pain or temperature, light touch, vibration, and position sense, as well as, if necessary, discriminative sensations (such as 2-point discrimination and stereognosis, if cortical lesions are suggested). Because all sensory lesions above the dorsal root ganglion do not cause standard sensory NCS abnormalities, the first aspect of the sensory examination is to attempt to differentiate cortical, central or lateral cord, or posterior column abnormalities. Differentiating pain and temperature (central cord or lateral spinothalamic tract) from vibration, as well as position sense (posterior columns) versus light touch (anterior spinothalamic and posterior column), sometimes can help in this effort. The second step in the sensory examination is to define a pattern where possible. Understanding typical peripheral nerve distributions and dermatomal (ie, radicular) distributions clearly is very useful. For example, the patient with complaints of a numb thumb may have any of multiple possible etiologies, from digital nerves to the brain. The examination finding of sensory abnormality may well be different than the complaint. If sensory examination results show abnormalities along the volar thumb, index finger, middle finger, and half of the ring finger, median nerve dysfunction may be suggested, as opposed to abnormality of the volar and dorsum of the thumb and index finger with additional findings along the distal forearm suggesting C6 root abnormality instead. Nondermatomal and nonperipheral nerve distribution abnormalities may indicate polyneuropathic problems for which distal versus proximal patterns need to be assessed. Finally, an attempt to clarify the type of sensory abnormality is important. For example, hyperalgesia, and allodynia may imply small, unmyelinated C-fiber or autonomic nerve dysfunction not seen on standard sensory NCS. Reflexes - Many of these reflex tests were covered in the motor examination section; however, remember these reflex pathways have a sensory afferent pathway and a motor efferent pathway. A lesion of either one impairs the reflex. Blink reflex - This reflex specifically evaluates cranial nerve V (ie, sensory pathway of the trigeminal nerve) and cranial nerve VII (ie, motor pathway of the facial nerve). Gag reflex - This reflex can evaluate either cranial nerve IX (glossopharyngeal) or X (vagus). Romberg sign - This test is often performed but is frequently misinterpreted. Patients are asked to stand with their feet together and then to close their eyes. Loss of balance or excessive sway after the eyes are closed is considered a positive Romberg sign. Mild swaying without loss of balance is normal. If the patient cannot maintain balance with his/her eyes open, the test cannot be completed. A positive Romberg sign implies loss of position sense or severely reduced peripheral sensation in general; however, it does not suggest a cerebellar lesion, which would result in the patient having difficulty maintaining balance with the eyes open or closed. The exact nature of the physical examination should be determined by the clinician and is influenced by many factors, including (but not limited to) the patient's history, physical findings, physician and patient time constraints, and patient preference. Not only should the physical examination clearly direct the electrophysiologic examination, it should serve also as a backdrop in interpreting the electrophysiologic findings. For example, examination findings of weakness and atrophy should correlate with electrodiagnostic findings of axonal loss. A finding of median nerve slowing at the wrist alone, without amplitude drop or evidence of denervation with a presumptive diagnosis of CTS, would be inadequate to explain weakness and atrophy. The lack of internal consistency here should alert the careful electromyographer to additional differentials and testing. A case of shoulder pain in which there is incidental electrodiagnostic evidence for C8 radiculopathy provides another example of interpreting the results of the electrodiagnostic evaluation in the context of the physical examination. If the physical examination findings suggest that most of the symptoms are related to an adhesive capsulitis problem, this finding should be noted clearly in the final conclusions. Such results indicate that the limited range and dysfunction with pain at the shoulder is not due to the C8 radiculopathy. An accurate and directed physical examination also can expedite the electrodiagnostic evaluation by potentially limiting the number of nerves and muscles that might otherwise be studied, and by helping the practitioner to form diagnostic impressions and therefore to be more specific. What physical assessment should be performed prior to the performance of electrodiagnostic medicine? What is included in the general physical assessment for electrodiagnostic medicine? What is the role of musculoskeletal assessment in electrodiagnostic medicine? What is included in the musculoskeletal exam for electrodiagnostic medicine? What is the role of neurologic assessment in electrodiagnostic medicine? What is included in a motor exam for electrodiagnostic medicine? How are deep versus superficial reflexes assessed in electrodiagnostic medicine? Which superficial reflexes are assessed in electrodiagnostic medicine? Which deep (muscle stretch) reflexes are assessed in electrodiagnostic medicine? What are the possible pathologic reflex findings on neurologic assessment for electrodiagnostic medicine? Which involuntary movements may be present during neurologic assessment for electrodiagnostic medicine? What is the role of sensory assessment in electrodiagnostic medicine? How is cranial nerve function assessed in electrodiagnostic medicine? How is the physical assessment for electrodiagnostic medicine determined? Bickley LS, Szilagyi PG. Bates' Guide to Physical Examination and History Taking. 9th ed. Philadelphia, Pa: Lippincott Williams & Wilkins; 2007. Campbell WW. DeJong's the Neurologic Examination. Incorporating the Fundamentals of Neuroanatomy and Neurophysiology. 6th ed. Philadelphia, Pa: Lippincott Williams & Wilkins; 2005. Kendall FP. Muscles. Testing and Function With Posture and Pain. 5th ed. Baltimore, Md: Lippincott Williams & Wilkins; 2005. DeLisa JA, Gans BM, eds. Rehabilitation Medicine. Principles and Practice. 3rd ed. Philadelphia, Pa: Lippincott-Raven; 1998. Shankar H, Hansen J, Thomas K. Phantom Pain in a Patient with Brachial Plexus Avulsion Injury. Pain Med. 2014 Dec 19. [Medline]. Mazur A. Role of thenar electromyography in the evaluation of carpal tunnel syndrome. Phys Med Rehabil Clin N Am. 1998 Nov. 9(4):755-64. [Medline]. Siddiqi ZA, Nasir A, Ahmed SN. The fourth dorsal interosseus pedis muscle: a useful muscle in routine electromyography. J Clin Neurophysiol. 2007 Dec. 24(6):444-9. [Medline]. Liveson JA. Peripheral Neurology. Case Studies in Electrodiagnosis. 2nd ed. Philadelphia, Pa: Davis; 1991. Fang J, Cui L, Liu M, Guan Y, Li X, Li D, et al. Differences in Dysfunction of Thenar and Hypothenar Motoneurons in Amyotrophic Lateral Sclerosis. Front Hum Neurosci. 2016. 10:99. [Medline]. [Full Text]. Jarvik JG, Comstock BA, Heagerty PJ, et al. Magnetic resonance imaging compared with electrodiagnostic studies in patients with suspected carpal tunnel syndrome: predicting symptoms, function, and surgical benefit at 1 year. J Neurosurg. 2008 Mar. 108(3):541-50. [Medline]. Moghekar AR, Moghekar AR, Karli N, Chaudhry V. Brachial plexopathies: etiology, frequency, and electrodiagnostic localization. J Clin Neuromuscul Dis. 2007 Sep. 9(1):243-7. [Medline]. Taiello AC, Spataro R, La Bella V. The Primitive Palmomental Reflex in Amyotrophic Lateral Sclerosis. Eur Neurol. 2018 Mar 22. 79 (3-4):187-191. [Medline]. Yim SY, Chang K, Ahn AR, Park EJ, Kim J. Contralateral involvement of congenital muscular torticollis and clavicular fracture. Am J Phys Med Rehabil. 2017 Nov 10. [Medline].